BoatLIFE GIT-Rot penetrates rotted wood and restores it to its original strength. Pour or inject this unique 2 part liquid epoxy into rotten wood fibers. It saturates fibers via capillary action and cures overnight. Git Rot cures into a resilient adhesive that arrests dry rot by bonding wood membranes together. The result is stronger than when the wood was new. Once cured, it can be sanded, painted, drilled, and fastened. Boatlife formulated it for compatibility with fiberglass resins, epoxy, and most sealants. 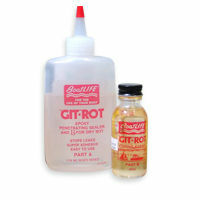 Intended for use on dried out, rotted, and weather wood, Git Rot is ideal for repairing stringers, roof rot, and transoms on both fiberglass and wood boats. Non-marine applications include window sashes, gutters, and other exterior repairs. HOW TO LOCATE DRY ROT Tap questionable areas with a hard instrument and listen for hollow sounding dead spots. Probe suspect areas with an ice pick or sharp knife. Check areas where fresh water is likely to accumulate. Particularly check the following: Spar checks, hatches, deck seams, transom, companion slides, checks in planking, toe rails, exposed end grain, stem, ribs, and stringers. AMOUNT REQUIRED For complete saturation and ultimate strength, in average type rot, it will require a volume of Git Rot approximately equal to half the volume of the rotted wood. TIME AND TEMPERATURE The optimum temperature for applying Git Rot is between 50 and 70F (10 and 21 C). Only mix small batches (no more than 4 oz.) since the larger the quantity the greater the reaction and the faster the cure. After adding 1 part "B" to 3 parts of "A", shake vigorously for at least one (1) full minute (TIP: use a watch while shaking the bottle.) Once the two parts have been thoroughly mixed, a thermal reaction will begin to occur. Penetration is best immediately after mixing. When working in temperatures over 70 F (21 C), chill Git Rot overnight. At 70 F, properly applied Git Rot solidifies into a tough resilient mass overnight. Allow one week for ultimate strength. Cold temperatures will slow the cure. When painting, check compatibility with paints. PROVIDE RESERVOIRS The mechanics of the actual treatment will vary for each case depending upon location and construction. Where rot is deep into a large member it is advisable to drill a staggered series of overlapping holes approximately 1/4" in diameter, 2" apart, slanting downwards. This will expose the necessary end grain and provide reservoirs for the penetration as shown here. In areas where sections of rot contain extensive holes where wood fibers are actually missing, it is recommended to mix sawdust with Git Rot and use it as a fill material. In areas such as transoms, stringers, and balsa core decking, drilling thru the fiberglass surface may be necessary. For transom repairs, you may drill vertically down through the transom, and then pour in Git Rot. For decking, drill thru the surface to treat the wood underneath. Holes left by drilling may be filled with a mixture of dry saw dust and Git Rot or a marine repair epoxy compound. PENETRATION Capillary action is the principal on which Git Rot works. Therefore, the most expedient way to apply the Git Rot is into the end grain of the wood wherever possible. To avoid trapping air in the middle of the rot always start at one end or on one surface and work progressively along. A considerable amount of patience is required during the actual penetration until complete saturation is achieved. This is determined when the reservoir holes fill and remain filled and the surface remains shiny. DAMPNESS Git Rot will eventually cure in damp wood. However, Git Rot will not displace water. So wet wood cannot be fully saturated. Any reduction in the amount of Git Rot simply reduces ultimate strength. Dry the affected area as much as possible. Soaking with acetone will assist drying; however, be cautious of fire hazard. CAUTION: Reaction between part A and B will produce heat. Do not use in high temperatures. Avoid all external additional heat sources. How many mixing containers come with the 16 oz order? and does hardener come with? I don't believe this product comes with mixing containers, the hardener is included. My plywood is feathered, meaning it is sticking up at the edges. Can I use a clamp after I amply the product to hold it down? Yes you can clamp the edge. Use some plastic sheeting under the clamp to keep it from sticking. does wood have to be totally dry before applying? I always used it when the wood was dry, but I really do not know if you can use it when the wood is wet. Boat life should have that information! Can you use git rot on log railings and then stain them? Sorry, can't help. I have only used it on rotting window frames, with great results. Don't know I used it on a boat transom and painted it. It works great. My experience with Git Rot is that it stops rot and gives strength to the blighted area. Mainly used it in the plywood areas and strength was acceptable. I am not sure on a railing because forces are different but in theory it should work. Get rot. How long does it stays liquid after mixing? Don't really know, but I never had it take a set while working with it. I honestly do not recall exactly. I had an edge of Marine plywood under some fiberglass that was pretty rotted, maybe about 18 inches worth. It stayed plenty workable for that....at least 25 minutes I would say. But I think it remained liquid for a bit afterwards. I used Get Rot on a favorite garden bench. I don't remember exactly how long it stayed liquid but I had to make little &quot;dams&quot; to hold the product in place while it cured. It has a long pot life and was great for my repair. It flowed in to all the nooks and crannies. It will be several hours. I have not had a chance to use it yet, so cannot answer this question. stripped lag bolts in motor mount going toinstall dow rod and then pour in git rot this should work correct ? Not sure what you wish to accomplish. I used it to repair soft spots in the transom of my Lyman. May also work as a hardened epoxy. J B weld?? I would think that thickened epoxy would be a better choice. I have found Git Rot to be very strong and reliable.However I would need to see a diagram of this actionbefore I could comment accurately on this. will it work on a rotted plywood backer that is glassed in , it is exposed now on one side and the remaining wood is soft and damp, I found it with a pressure washer while cleaning out the bilge, will it work in this application? As long as you have good access to the rotted wood it will work fine. It does not penetrate through paint or fiberglass. Sorry, but I can't help with this question. I am using it for historical restoration of a building -- no plywood, or boating experience. Yes, perfect application but it will not displace water. Let it dry first then got rot will work very well. can this be applied with a sprayer? Probably but what's the point? The idea behind this is to penetrate the fibers of the wood by allowing it to infiltrate from the inside: thus the drilling. If you just put it on the surface, unless you are spraying it on endgrain, it won't go anywhere: it will just stay there. It will toughen up the top but do nothing for the interior rot. I don't think this would work with a conventional sprayer, as the viscosity is quite high. Better to brush it. I also found that it worked best when it was used to penetrate into the wood as opposed to being a surface treatment. I've injected this into rotted wood by drilling numerous holes. I can't see how spraying would work. I don't have experience with this type of repair. I've used the stuff successfully for small repairs in 1/4&quot; plywood on a boat bottom and also on non-structural areas on window sills. You will have to introduce the Git Rot in many areas all over the end of the beam. You need to create reservoirs for the epoxy to continue feeding into the damaged wood. I don't now how far it could penetrate. Sorry that's all I can offer. I would say yes most beams are structural and I would not try to patch it with git rot. Thank you Vincent. I will give it a try. Have used it on boats before, but never on this big of job. Thanks James. I will give it a try. No! I have done an entire boat keel that had extensive dry rot an it worked fine. My plan is to pour it. Don't think spray would get it on thick enough. Had to soak into wood. Spray it if you want to but the whole idea of the product is to get it to penetrate into the wood not just make a film on the surface. This is not a sealant. I don't believe spraying it would be an effective use. To work properly it needs to penetrate the fibers of the wood. I had some stringers that were not too bad, but had a few spots that were a bit questionable. Drilling holes and filling those areas with the product seems to be the most effective way to use it. Then after it dried (a few days) I mixed some 2 part epoxy, finished filling, sanded, and fiberglassed. It worked well for me on that particular project. no. you drill small holes and inject a 2 part liquid. I don't know, as I have only used the suggested method of drilling holes into the rotted area and filling them repeatedly with Got Rot. Spraying might work if the rot is only a surface condition but I doubt that there would be sufficient penetration to deep rot. Excellent product for use with antique automobiles! I have used this product for years in the repair and restoration of wood-framed antique automobile bodies. Best product I have found to tighten loose joints, worn door hinge mountings, and general deterioration of wood resulting from age, wear, road vibration damage. Easy to use and mix. Knowing the mixture is thin makes it easier to apply but you must prepare for the quick flow. Great penetration into the rotten wood area as well as the good wood area.Have used it in the past with great success and it continues to impress me. Remember it is slow curing so be patient before applying second coating or sealing up the repaired area. Product as remembered, but delivered without cap for mixing/squeeze bottle. Inconvenient but not insurmountable. I had used Git Rot on boats for thirty years! Although away from the waterfront now, I still find it as useful and dependable as ever. The price seems to be too high for the quantity of product. Set time was too long. I used the product in the amounts indicated and at temperatures in the 60's. It took days for the product to set. great product ..I would buy again!! I used Git-Rot to repair a 150yr old wooden cross. I was able to repair large dry rot problems and still keep the cross in uses. The product is great and simple to mix and use. However the hazmat handeling fee was a surprise and something that I was not charged when I reordered more of the product from another company.